- Gross Profit ratio has declined primarily due to increase in net sales by 20.4% due to rise in oil prices whereas gross profit has increased by 6.7%. - Net profit ratio went down by 29.8% primarily due to decline in net profit by 15.2% and increase in net sales by 20.4%. 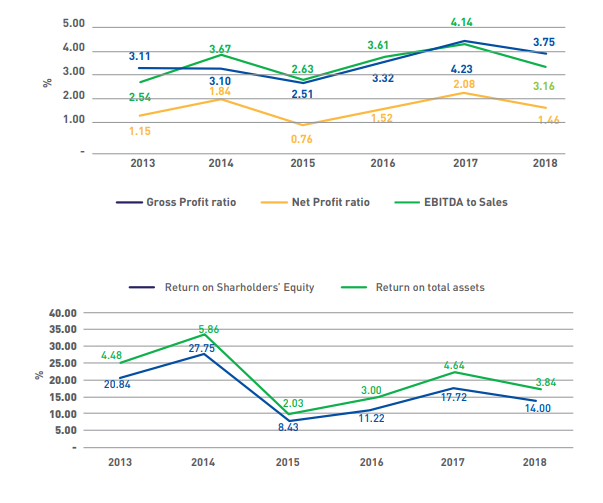 - EBITDA margin has decreased by 23.7% primarily due to decline in interest income on account of maturity of PIBs in July 2017 and higher exchange losses due to PKR devlauation during the year. - Decline in return on shareholders' equity, return on total assets and capital employed is due to decline in net profit by 15.2%. - Negative operating leverage is due to decline of 8.5% in EBIT against an increase of 20.4% in net sales. - Interest cover has increased primarily due to decline in finance cost by 13.5%. - Operating gearing ratio and financial leverage ratio has decreased primarily due to decline in short term borrowing by 31.2%. 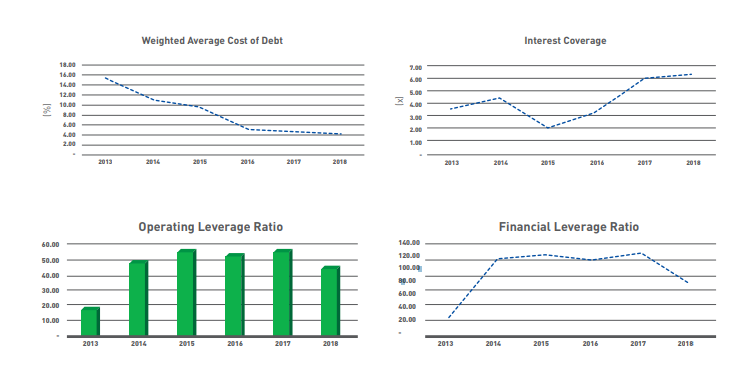 - Weighted average cost of debt has decreased due to decline in borrowing rates due to robust negotiation with banks and effective borrowing mix. - Cash to current liabilities has improved primarily due to decline in short term borrowings by 31.2%. - Cash flow from operations to sales has increased primarily due to increase in trade payable. 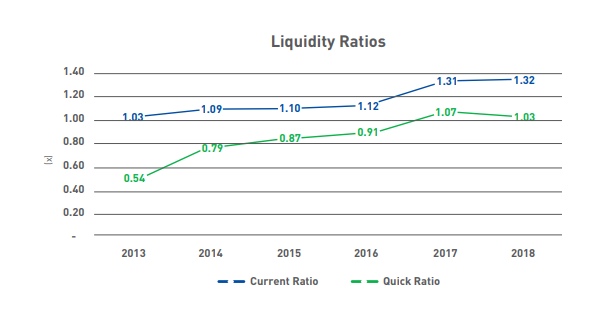 - Current ratio has increased due to increase in current assets (2.6%) vs. increase in current liabilities by (1.9%). - Quick ratio has decreased due to decline in quick assets (current assets excluding stocks) due to maturity of PIBs in July 2017. - Price earning ratio has declined slightly due to more decrease in market value per share i.e., by 17.8% in comparison to decrease in EPS i.e., by 15.2%. - Decline in price to book ratio is primarily due to decline in market value per share. 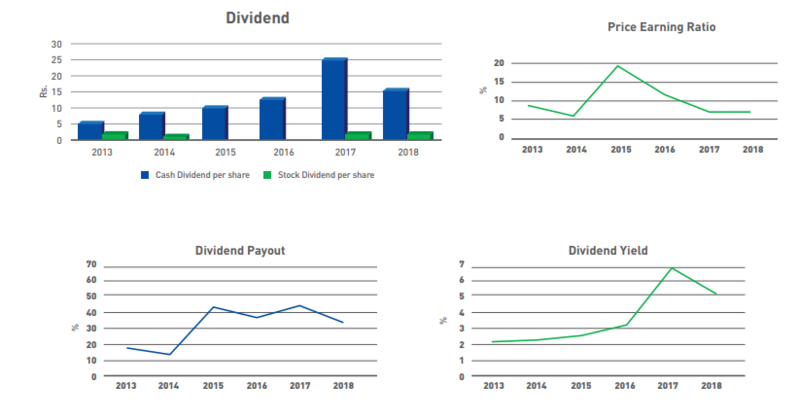 - Dividend payout and yield has decreased whereas Dividend cover has increased due to decline in cash dividend from Rs. 25 per share to Rs. 15 per share. - Breakup value per share has increased due to retention of profits. * Note: Inventory, Debtor and Creditor turn over ratios have been calculated using closing values rather than average values. - Inventory turnover has decreased primarily due to increase in inventory by 23.0% mainly due to increase in international oil prices which was partially offset by 19.0% increase in gross sales revenue. - Debtors turnover has increased by 3.4% primarily due to increase in gross revenue by 19.0% and trade debts by 16.0% on account of increasing international oil prices and continuous defaults by power sector respectively. - Creditors turnover has decreased primarily due to increase in trade payable as at reporting date on account of increase in international oil prices which was partially offset by increase in purchases during the year. - Total Assets and Fixed Asset turnover has increased by 10.0% and 13.3% respectively mainly due to increase in gross sales revenue by 19.0% during the year. - Operating cycle has decreased by 17.2% primarily due to increase in creditor days on account of increase in trade payables (because of increase in international oil prices).